Would you like to see my stitches? As it coming up to Easter, I was looking for something to send to my niece and nephew to accompany the traditional chocolaty gifts. Last year I made them some Easter chicks which were very popular but nothing traditionally spring-like was inspiring me this year. Browsing Ravelry, I found this pattern which was so cute, it was begging to be made. 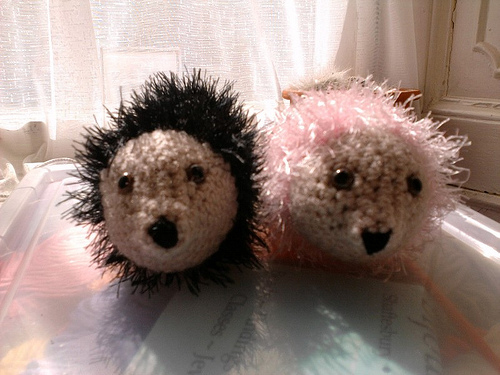 So hedgehogs aren’t a usual Easter motif. They are so sweet that I don’t think their new owners will care. Pink wouldn't have been my first choice but the stocks of fun fur in my local wool shop were limited to these two colours.